HE HAS defeated the dreaded Daleks, the Cybermen and hairy, marauding nasties too numerous to mention, but it appears Dr Who's time-travelling career has been brought to an end by an enemy even more horrifying: Roseanne Barr. A senior BBC executive revealed yesterday that time may have run out for the programme voted favourite popular series at the BBC's 60th anniversary awards this year, because the corporation cannot afford to make a new series on its own. 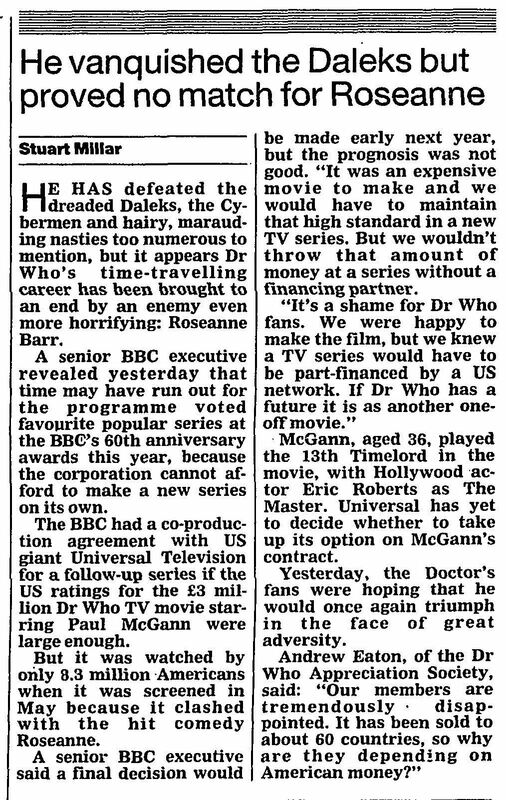 The BBC had a co-production agreement with US giant Universal Television for a follow-up series if the US ratings for the £3 million Dr Who TV movie starring Paul McGann were large enough. But it was watched by only 8.3 million Americans when it was screened in May because it clashed with the hit comedy Roseanne. A senior BBC executive said a final decision would be made early next year, but the prognosis was not good. "It was an expensive movie to make and we would have to maintain that high standard in a new TV series. But we wouldn't throw that amount of money at a series without a financing partner. "It's a shame for Dr Who fans. We were happy to make the film, but we knew a TV series would have to be part-financed by a US network. If Dr Who has a future it is as another one-off movie." McGann, aged 36, played the 13th Timelord in the movie, with Hollywood actor Eric Roberts as The Master. Universal has yet to decide whether to take up its option on McGann's contract. Yesterday, the Doctor's fans were hoping that he would once again triumph in the face of great adversity. Andrew Eaton, of the Dr Who Appreciation Society, said: "Our members are tremendously disappointed. It has been sold to about 60 countries, so why are they depending on American money?" APA 6th ed. : Millar, Stuart (1996-12-07). He vanquished the Daleks but proved no match for Roseanne. The Guardian . MLA 7th ed. : Millar, Stuart. "He vanquished the Daleks but proved no match for Roseanne." The Guardian [add city] 1996-12-07. Print. Turabian: Millar, Stuart. "He vanquished the Daleks but proved no match for Roseanne." The Guardian, 1996-12-07, section, edition. This page was last modified on 16 September 2017, at 12:13.